Like Quotable? Click here to view the entire range. Simplicity can be effective, so why not show someone you simply just think about them with this card from the quotable card range. 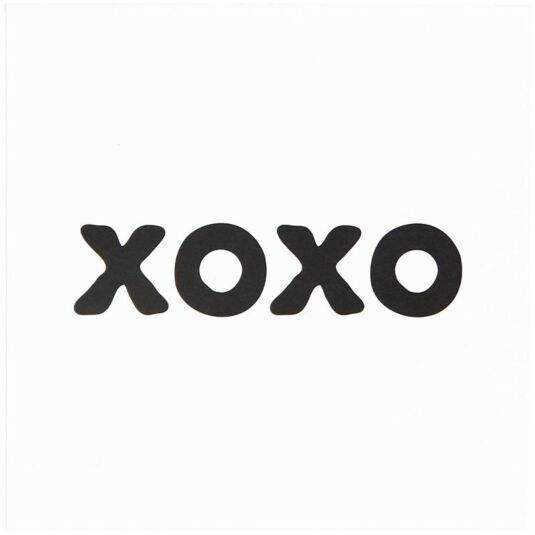 A white card is printed with the wording ‘XOXO’ in a black font. A reference to the use of noughts and crosses in the middle ages is found on the reverse of the card. This card is interiorly printed blank. Packaged with a white envelope. Quotable Cards began in 1993 with a very simple idea: to inspire as many people as possible. Gillian Simon and Matt Fernandes-Vogel knew there were people out there like themselves who wanted smart, simple cards that just weren't available at the time. They had an idea to quote great writers, artists, and thinkers and use their words as the foundation for the design, resulting in the original and incomparable typographical style of quotable. This remains the often imitated, never replicated look of the line to this day. What started as a line of 48 black & white cards has grown into a full and flourishing line of black & white and colour cards, magnets, mugs, and a variety of other gift items. Quotable has always had a singular focus on producing high quality products that stand the test of time. Eighteen years later, the line is as carefully crafted as ever. Everything Quotable still comes out of one room in New York City. Though the room may have grown a bit bigger, and Gillian and Matt may have picked up a few employees along the way, Quotable still operates with the care, ingenuity, and personal attention of the start-up it once was.